Brandon Marshall has his quarterback's back. You know, this makes sense. 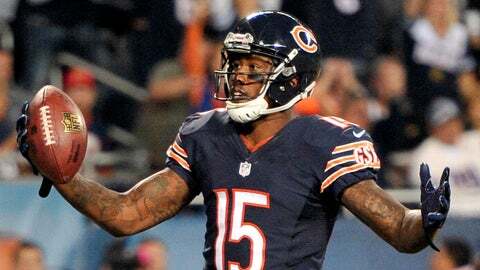 Bears wide receiver Brandon Marshall confirmed a Sunday report from FOX NFL Insider Jay Glazer that people in the Bears organization didn’t whole-heartedly support the return of starting quarterback Jay Cutler. After all, backup Josh McCown had been playing well and had Chicago’s offense firing on all cylinders. And sports aren’t played in a vacuum. "I’m gonna be honest with you, there is a little chatter," Marshall said on Jay Mohr’s FOX Sports radio show. "There’s a human-element side of things in the sporting world. "You have a QB like Josh McCown playing so hot, not only playing great ball for the Bears, but he’s one of the hotter QBs in the NFL … so naturally there’s going to be a little chatter." Some might say that there’s reason for concern here, since a little chatter could quickly grow to a loud roar, especially if Cutler were to have struggled in his first game. Fortunately for Jay, he did throw three touchdown passes and led the Bears to a tough road victory against the Browns in Week 15. "But at the end of the day we know that Jay Cutler is our QB. He’s our franchise … he’s our leader." When you have the undying support from a guy like Marshall, you must be doing something right.